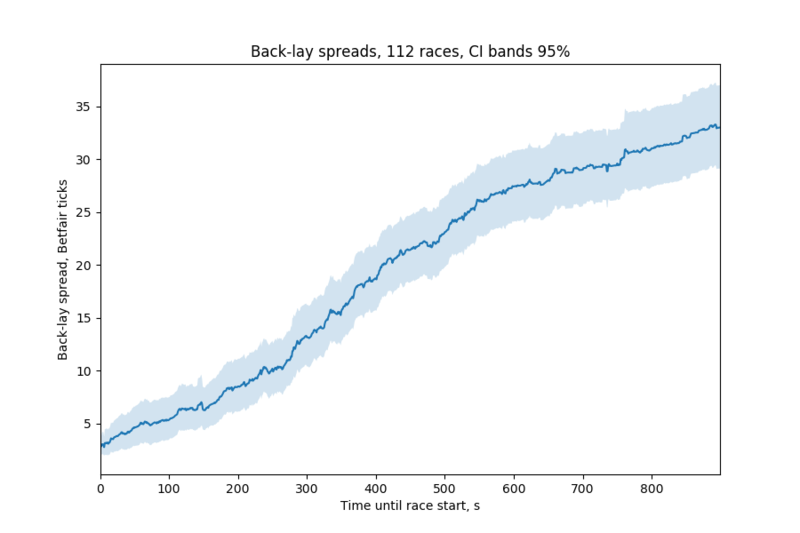 Previously on project Betfair, we implemented a simple market making strategy and backtested it against some horse races, with disastrous results. Today, things get better. Though most of this has been done on horse racing markets, I was also experimenting on-and-off with greyhound racing. I'll be looking at those in depth later, but for now, some quick plots. First, most action in greyhound markets happens way closer to the beginning of the race. 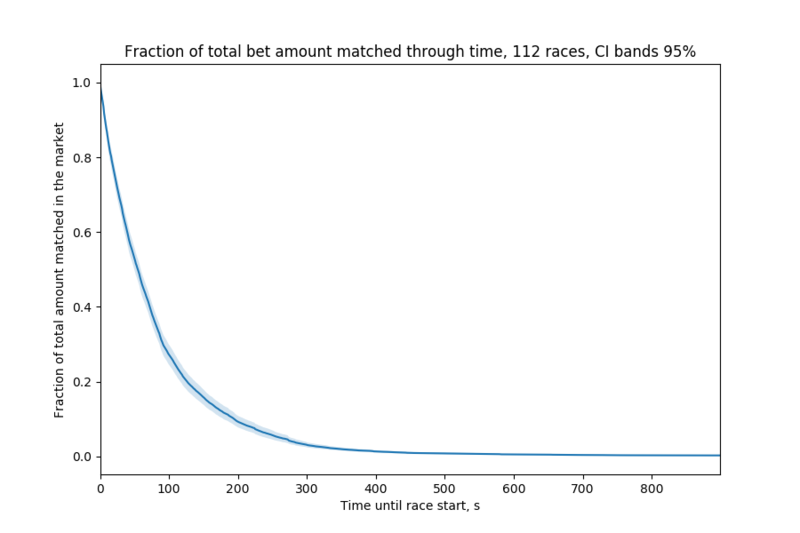 Half of all the bets are matched less than a minute before the race starts! In addition, the back-lay spreads are much, much wider than in horse markets. Even 2 minutes before start there can be 5 ticks between the best back and lay quote. So how does the naive version of CAFBot do on these markets? Not that well. 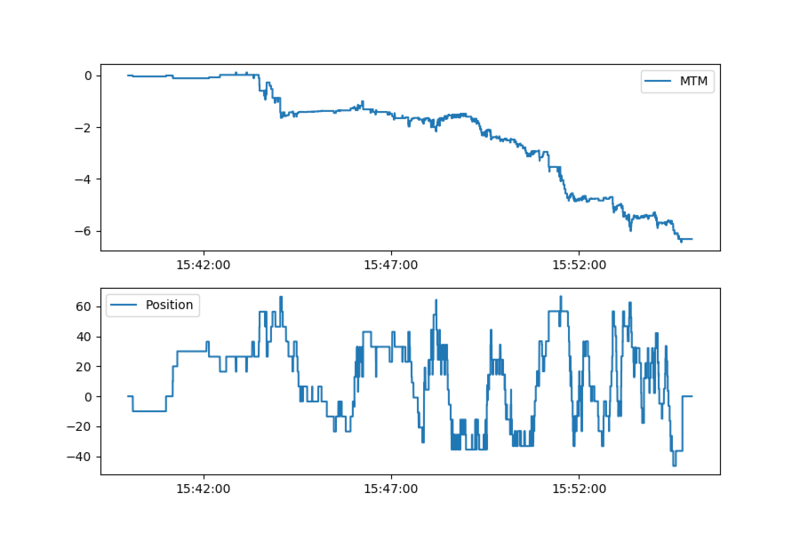 Looking at the odds chart for an example market, it seems like there are a lot of sporadic jumps where, sort of like in the example horse market from the previous post, the price goes "through" us (i.e. we're the last in the queue at a given price level to get our bet matched, after which that price level flips to the opposite side of the book). Like I had mentioned before, there are plenty of papers on market making. Despite that they're written with real-world (equity, futures etc) markets in mind, there are still a lot of things they investigate that can apply to this problem. High-frequency market-making with inventory constraints and directional bets by Fodra, Labadie (2012) has a decent introduction to what a market maker does and what sort of controls it can have over its behaviour (together with some alarmingly large differential equations). It's based on an earlier paper: High-frequency trading in a limit order book by Avellaneda, Stoikov (2008) which had some very good presentation slides that I got some of the following ideas from. Finally, Exploring Market Making Strategy for High Frequency Trading: An Agent-Based Approach by Xiong, Yamada, and Terano has a nice overview of several market-making strategies. According to those papers, there are two risks a market maker faces. The first is inventory risk, which is what we had an issue with last time. If one side of a market maker's quotes gets executed more often than the other, it accumulates an inventory of shares (in the case of equity markets) and is no longer market-neutral (its profit is now dependent on price moves in the market). 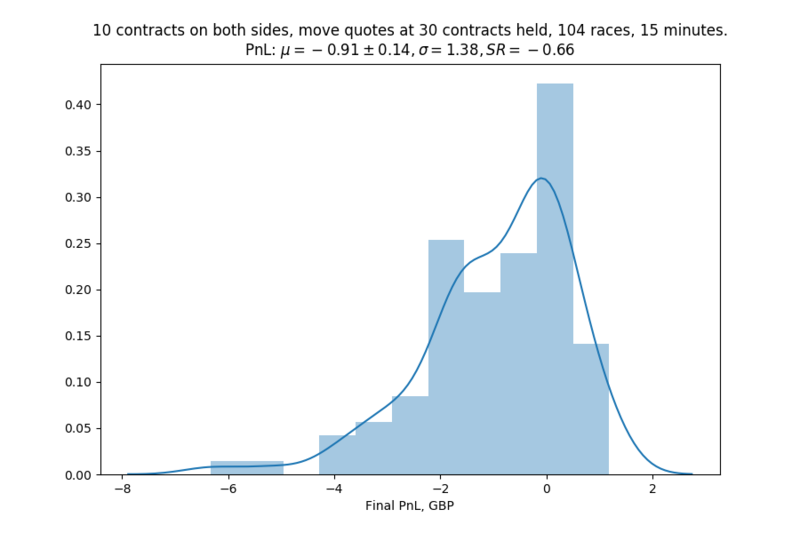 There are two main ways to control our market maker: by specifying at what odds (or whether) it makes the market and the number of one-pound contracts it offers on each side. For example, if its exposure is getting too positive (it's backed a runner too much), it can either decrease its offers in size or offer other people to lay at higher odds, thus getting a higher premium from increasing its exposure even more. 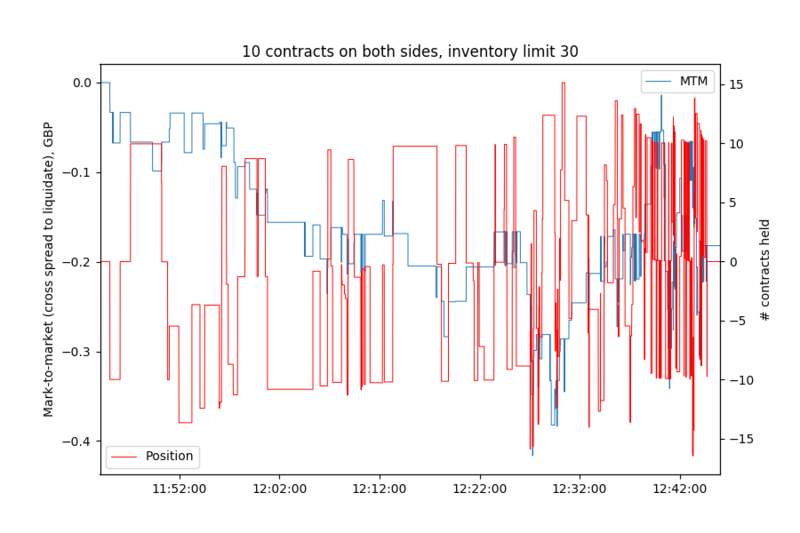 Managing inventory risk is essentially a trade-off: if we limit it to a minimum, we might miss out on earning the spread when there's not much price movement going on, whereas if we don't control it at all, we risk exposing ourselves to the market too much (having to liquidate our position in the end). when it's 30 contracts long, offer 0 to buy and 10 to sell. Sort of. 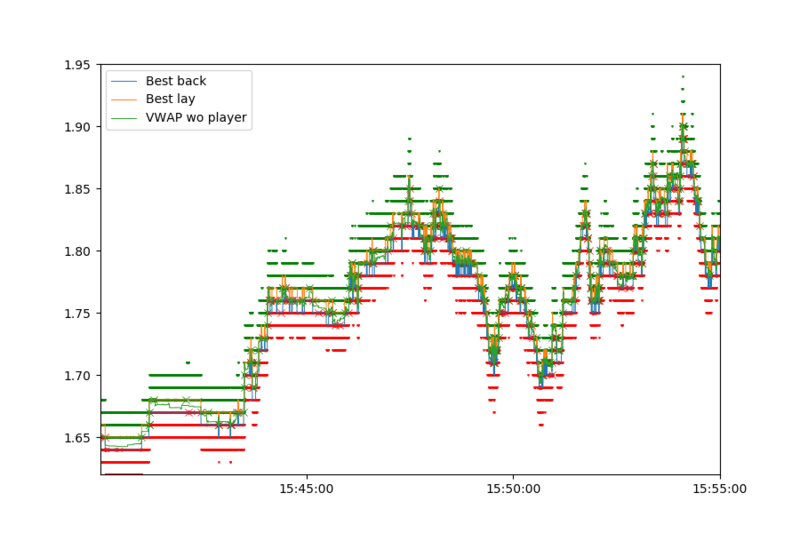 This is the PnL and position chart for the same market as in the previous post. It looks like the exposure management works: it's almost always bounded between -15 and +15 contracts. The profit has improved vastly (we now lose about £0.18 instead of £1.70 from the previous version), but this could be simply due to the fact that our average exposure is now smaller (on average -5 contracts) than that of the previous version (on average -65 contracts). Running it on the full dataset we get this sad picture. While the average profit increased, its standard deviation didn't decrease as much: the Sharpe ratio of this strategy is -0.91. To compare, the previous incarnation of CAFBot had a Sharpe ratio of -1.52 / 3.55 = -0.43. The prices move back to 2.00/2.02. We replace our bets again. 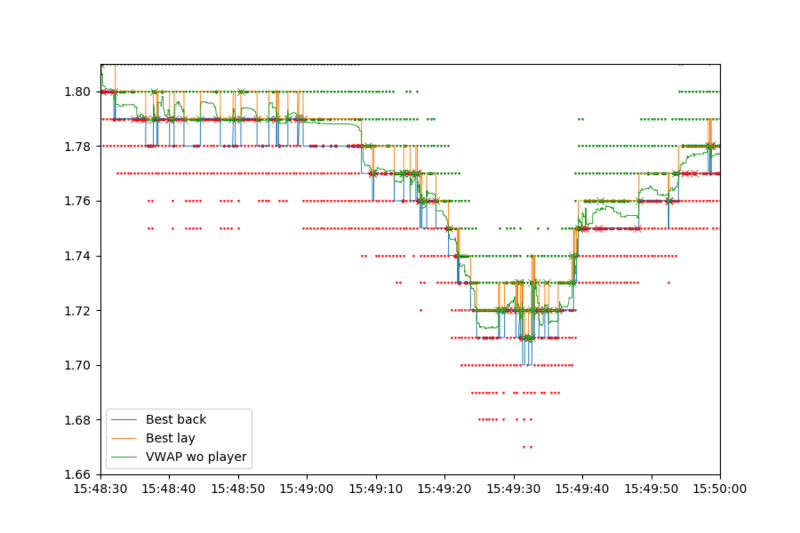 What happened there at the 2.00 back level was that we had to cancel a bet and then replace it shortly after when the prices recovered, thus losing our position in the match queue. 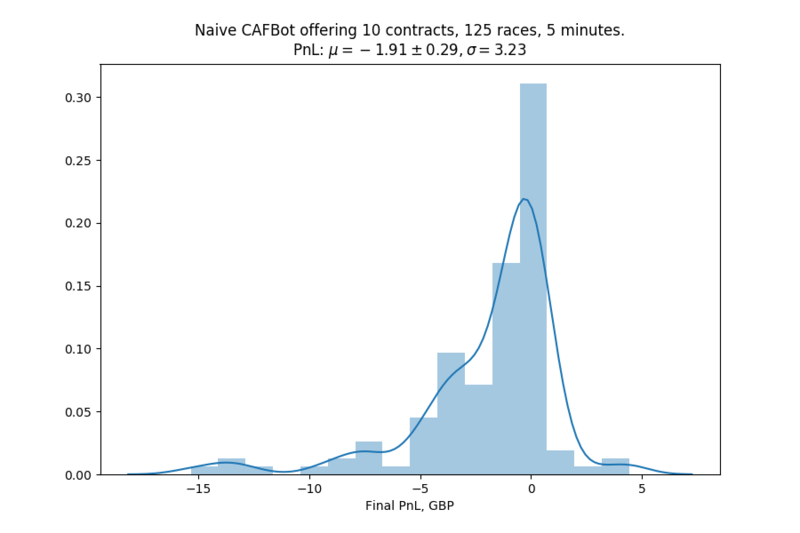 The addition I had was to maintain bets at several price levels: best back, 1 tick lower than the best back and 2 ticks lower than the best back (likewise for the lay side) etc. That meant, at a larger capital commitment, that the bot would still maintain its position in the queue if the prices changed for a bit. This doesn't actually require any more betting actions to do for a 1-tick move: instead of cancelling a bet at 2.00 and replacing it at 2.02 the bot would, say, cancel a bet at 1.99 and replace it at 2.02. The papers also mention where to make the market as a way to control the inventory (some of them define it as a mid ± spread). 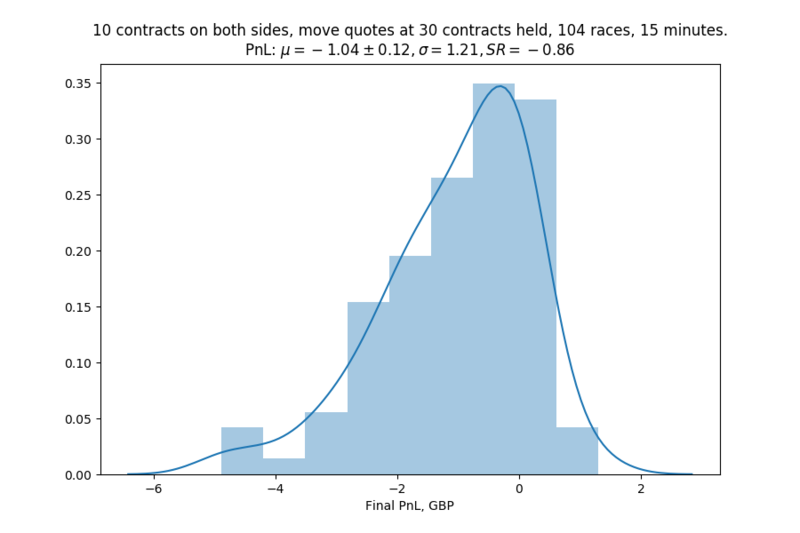 Most of them use a solution to those differential equations in order to come up with an function defining the bid and ask to make a market at, but I decided not to go with that, since Betfair markets have varying granularities and spreads are usually already tight enough (in essence, anything that was more than a few ticks away from the best bid wouldn't have a chance to get matched anyway). Instead of replacing the bet at 2.00, we now make the market at 1.99 best back / 2.02 best lay. For my limit in this test, I used 30 contracts: with 10 contracts offered, that meant the bot would move the quote after its offer got matched 3 times on one side. I also used the making market on several odds feature to not cancel bets unless the price moves too far away from them, placing bets at 3 levels on both sides of the book. So, how did it do on our test market? Oooh. We finally started making money, kind of. Closer to the race beginning, as matched volumes picked up, the MTM shot up dramatically, albeit dropping as dramatically in the end. It still ended trading with about £0.60 of profit, which is pretty cool. 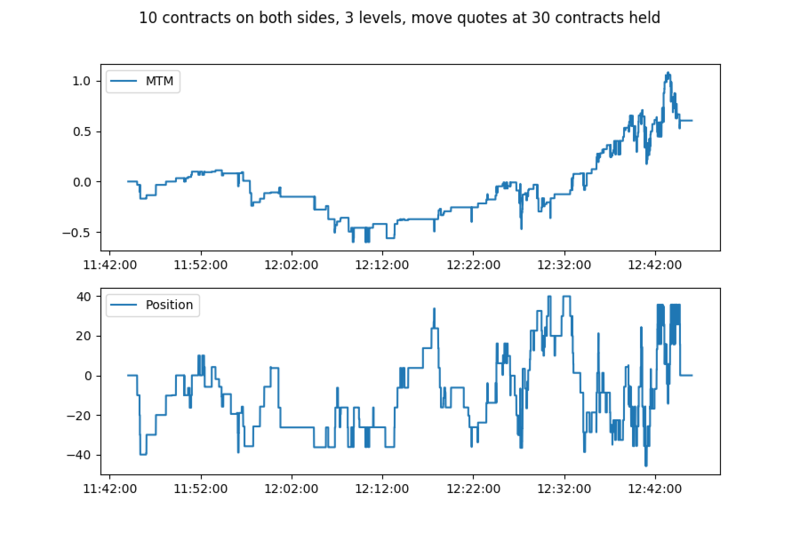 In addition, the average exposure was -6.6 contracts: in a market where the odds were trending down (they went from about 3.9 to 3.4, 10 ticks), the bot's exposure was against it (since the contract price, the inverse of the odds, went up) and yet it still made money. Hence the bot did manage to profit from the spread. 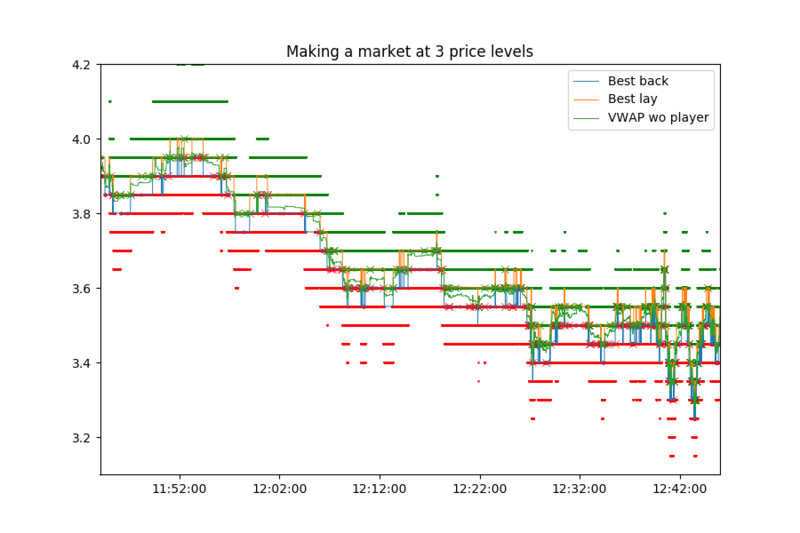 Finally, placing our bets on several levels helped too: on this plot, the bold green and red lines are price levels at which the bot had an offer. You can see it's often the case that a green/red line is not interrupted when the price moves slightly away from it, meaning the bot doesn't cancel a bet and lose its position in the queue. In fact, on the same market, but with only 1 bet on both sides, the bot would have made only £0.20. Let's test it on the whole dataset now. Not that good, actually. The Sharpe ratio is better than the previous version, but we lost more money on average. At least making a market at 3 price levels helped (below are the results for placing just 1 bet on each side). So what happened? Let's take a look at the worst market we traded. It's... choppy. The price is jumping all over the place and there are very few times when it doesn't move (which is where this strategy really shines). There are, on the other hand, many points where the price goes "through" the bot's bet, resulting in it having an opposite exposure to the way the price went. Looking closer, we can see how wild this market is: in the span of 90 seconds the odds crashed from 1.80 down 10 ticks to 1.70 and then back up again. 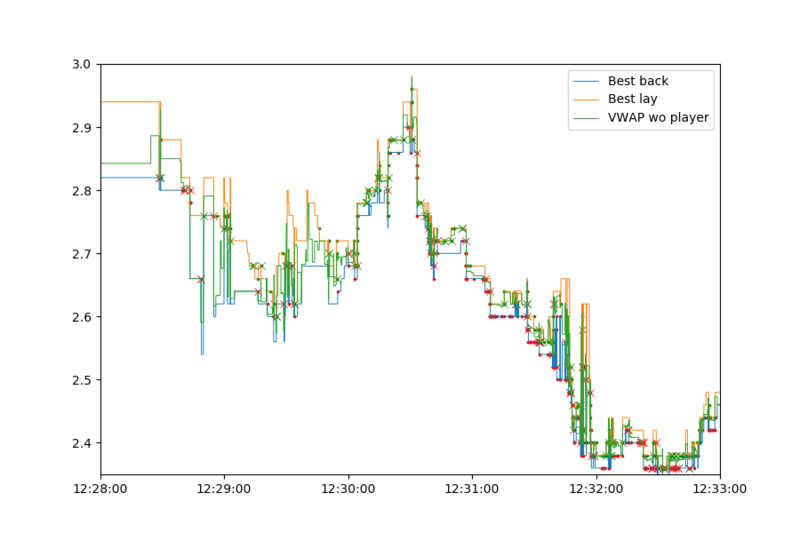 In addition, in the first 30 seconds the best back/lay oscillated between 2 levels and the bot would diligently follow it, getting executed at 1.79 and then having its position closed at the same or worse price. 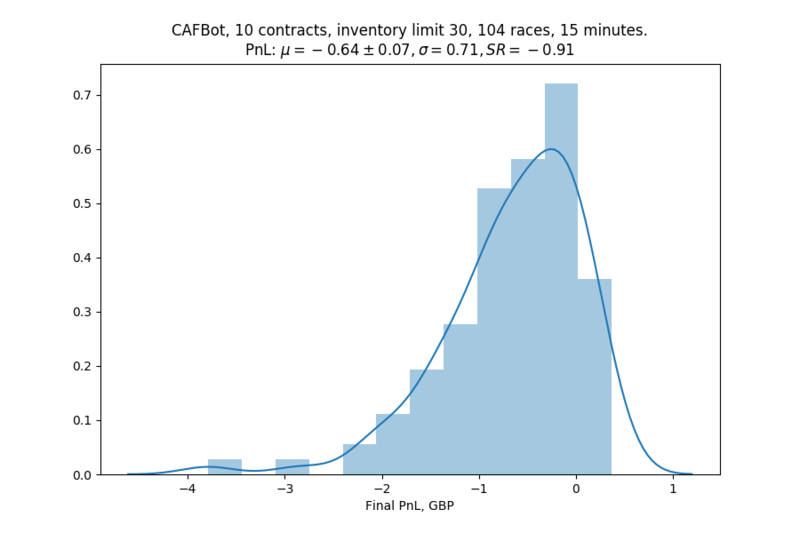 So all in all, while inventory control does help the bot not place too many directional bets, it still doesn't help it make money. The second risk a market maker faces is adverse selection, the risk from information asymmetry. Someone who does cross the spread gets the benefit of choosing when their order gets executed, whereas a market maker simply posts orders and doesn't have any control over when or whether they will get hit. This creates a bias in favour of the person trading against the market maker: what if some of them are crossing the spread because they know the market is going to move, as in, they're informed traders? Let's say there's been some sudden bad news from Apple during trading hours and people start selling Apple shares. A naive market maker that doesn't know what's happening will continue offering to buy them despite that the market clearing price will very soon move down. In the case of Betfair markets, perhaps there can be a macro-level trend (even if the trend is a self-fulfilling prophecy) that the market maker doesn't take into account and more slower traders do, thus trading in a way that perpetuates the trend. So is there a way to protect ourselves against that? What if the bot could somehow anticipate imminent price movements that might hurt it if it has an exposure to the market and move its quotes or liquidate its position? Perhaps it can. Next time on project Betfair, we'll delve deeper into market microstructure and find out that at a very micro level, markets sometimes aren't as unpredictable as we thought.